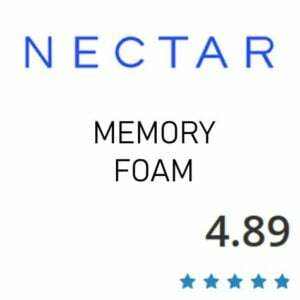 Overall, NECTAR is one of the best gel memory foam mattresses we had reviewed. When you look at foam densities, build and price, it’s just hard to beat. The overall quality is high end and outdoes many that are $200-300 more. Nectar Sleep is one of the fastest growing companies in the world and we are huge fans of the USA Nectar mattress. So naturally we wanted to see the UK version too. Is the Nectar UK as good as they say and as good as the USA version? We sourced the most honest customer reviews we could find and coupled it with our own independent research to find out if the Nectar mattress really does live up to the hype! 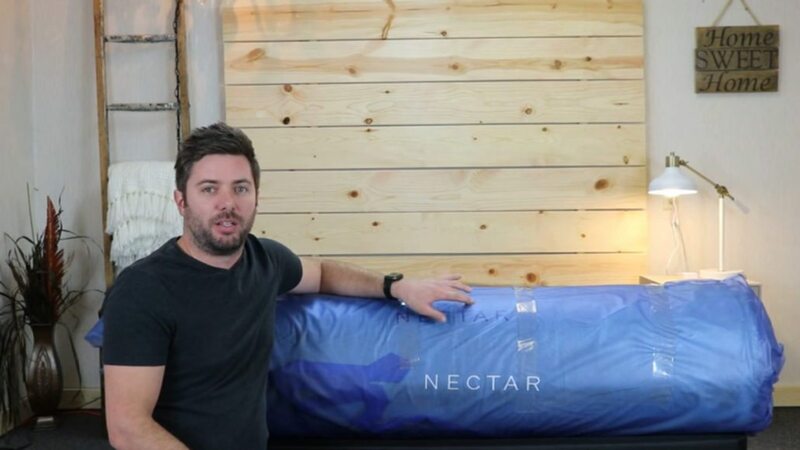 As one of the most thoroughly advertised mattresses we have yet reviewed, the Nectar stands out as the peak of branding perfection. With their signature “It’s like sleeping on a Cloud” marketing campaign combining seamlessly with a high quality product we expect great things from the Nectar mattress. As a full foam mattress Nectar have ensured they added a cooling cover to make the bed more suitable to all. 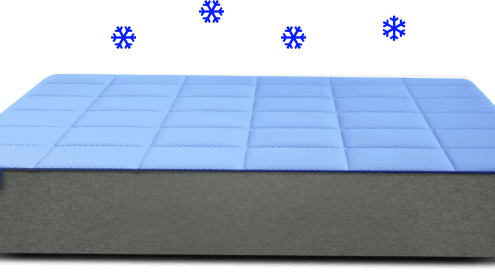 It also carries that all-important Certipur certification on all of its foam and comes with a full year’s trial period…So far all seems wonderful – but let’s go into depth about how the mattress itself performs. As we mentioned above, the Nectar mattress performs outstandingly in the branding category. From the eastern coast of America to the western coast of the UK – everyone has heard of Nectar and recognises that they make high quality mattresses. This is a brand with a 7 day a week customer service department who are willing to go the extra mile to ensure the consumer’s satisfaction. Secure, convenient payments and fast delivery combined with the ability to offer 365 days of trial on each mattress, offers huge assurances when you part with your cash. 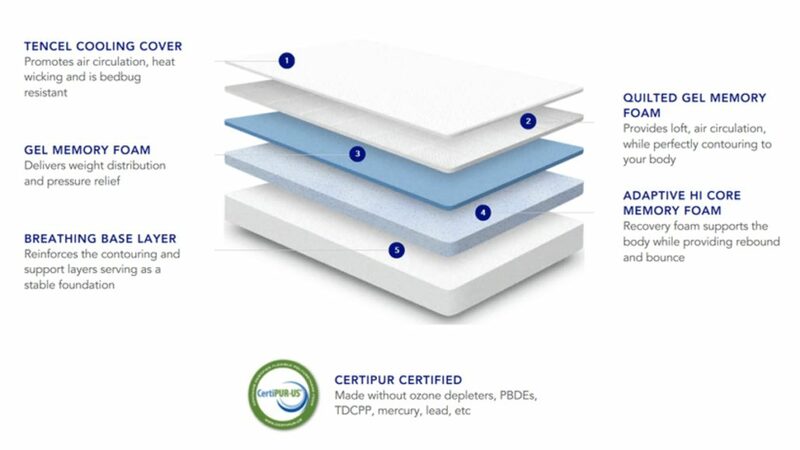 As well as a huge customer service department Nectar also boasts Certipur certification – meaning that all of their mattresses are completely non-toxic and are totally safe even for the youngest child to sleep on. In addition to perfecting their model through huge investments in research and development; Nectar also work with ClimatePartner to seriously lower the impact and carbon footprint of every mattress we sell. This process not only focuses on lowering emissions but also allows customers to enter their unique code through the ClimatePartner website so they can actually track and monitor the emissions produced by their own mattress. Nectar really do go all out to ensure their customers are happy… alongside a fantastic marketing campaign and superb Eco awareness; we had no choice but to award them 10 out of 10 for branding. Also, the 365-night trial and Forever Warranty are very impressive. We’ve taken the recent advances in mattress and fabric technology and run with them. Having figured out the optimal levels of firmness, coolness, breathability, and comfort – we put them all on one mattress, making it the best you’ve ever slept on. Period. Nectar is designed to feel very supportive yet soft at the same time with good quality memory foam that provides excellent pressure relief. 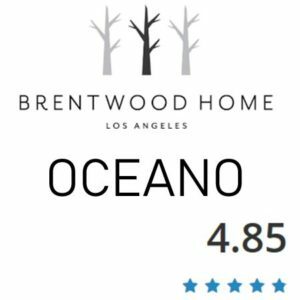 See our full Review below. Want quality materials for a right price. The Nectar is one the best-made mattresses we have come across for the price. Build quality, warranty, trial period and the overall feel are above average. The overall feel and quality of the foam in the Nectar is impressive for the price. It is one of the best-made in relation to how much they price it. It’s better quality than dozens of other available options online, and the value for money is what makes it stand out than most of them. Area person who likes the memory foam feel. Nectar rivals the feeling of some big name brands like Tempurpedic mattresses, but you won’t pay the hefty up-charge for the brand name. There are some foam mattresses you may lay down on but didn’t feel that luxury or substantial feel. Nectar feels high end. I have beds on my show floor that feel similar but are $200-400 more, and I run a low overhead discount type store. So you are getting a lot of bang for the buck. Sleep hot. This mattress is made of a gel infused memory foam which helps to keep the mattress cooler than traditional memory foam. While still feeling like a gel, the copper, graphite-infused foams can even trap heat a little more than a custom poly foam or latex, that’s why you’ll have a much more relaxing feel in your sleep that the traditional memory foams. I found the Nectar to perform well in this area. Are interested in buying online but worried you wouldn’t like your choice. You get an entire year to try Nectar! Nectar is one of only a couple brands that offer trials beyond 120 days or so. Most people will know if their mattress is going to work within 3-4 weeks, but it’s still a nice perk to have that much time to try it out. Will be using an adjustable base. If you own or plan to buy an adjustable base at some point, the Nectar performs well on the base. It bends easily and lays back to the flat position once you are finished inclining. An adjustable base can add a lot of comforts and can even help with things like acid reflux and snoring. • Love a full foam bed but tend to sleep hot – that specialised top layer will really let you get the best of both worlds! • Are looking for a luxury mattress at a great value price – as well as having a standard lower price than most luxury bedding, Nectar frequently run promotions that can help you save even more. In their New Year’s sale, for example, two free pillows were given away with every sale. You prefer coiled foams and pads. If you have tested foam mattresses and didn’t like them, I don’t believe the Nectar will change your mind on that preference. A foam mattress, generally speaking, have the best pressure relief and for sure will have the best motion isolation. But some people prefer more bounce and ease of moving around which a hybrid or innerspring mattress provides more. If you are not sure, it might pay to stop in a store to feel the difference and decide what you think you will like better. Prefer a very soft feel. Nectar has more of a medium to medium firm feel. I like to sell mattresses that start a little firmer as they will break in and get softer over time. Nectar will do the same. Everyone is very different however in what they consider soft or firm. I sometimes get people in my store that think my softest mattress is firm and my firmest mattress is not firm enough. With almost 2500 reviews and an average of 4.8/5 stars. below are some good customer And a couple of so-so reviews. I needed to find an affordable, yet good quality mattress. The mattress arrived quickly. It was effortless to set up because all you have to do is unroll it and remove the plastic wrap as you roll and that’s it. This is my first memory foam mattress, and so far I prefer it to my traditional mattress. I’ve never bought a mattress sight unseen, but I bought this mattress based mostly on gut and reviews. And guess what? My gut was spot on. Sleeping on this mattress is what I would imagine heaven feels like. I can honestly say this is the best mattress I’ve ever owned. The mattress is good. Can’t complain about that. But the shipping issues when ordering are RIDICULOUS. If they tightened up their distribution, I’d have no complaints. But my shipment was pushed back 3 WEEKS from the point I ordered it. Loving the bed. My order took a while longer than original ETA, but customer service team responded promptly after I reached out. It’s unfortunate that I was not notified beforehand that my shipment date would change, or else it would be a 5 out of 5 stars rating. Keep up the good work! Delivery of the Nectar Mattress takes between five and ten working days from the point of sale. Once your order has been placed and paid for your mattress will begin its journey. Don’t forget you can track its progress with ClimatePartner! The mattress will arrive in a box, which might seem odd but which helps keep carbon emissions low while it travels to you. Inside the box your mattress will be vacuum sealed inside some wrapping, so make sure your first step is to take it to the room you want to place it in before you start to unpack it. Take a sharp tool and use it to cut away both the outer box and the inner wrapping and then step back to watch your mattress expand! A mattress can take up to 24 hours to expand fully but you should be able to sleep on it before then with the aid of a mattress protector and some fresh sheets. Once the mattress is fully expanded you can experience the best night’s sleep you have ever had – but do give it a few nights trial before you decide permanently either way. To us, off-gassing is a bit of a deceptive term. Especially when it comes to any Certipur mattress. 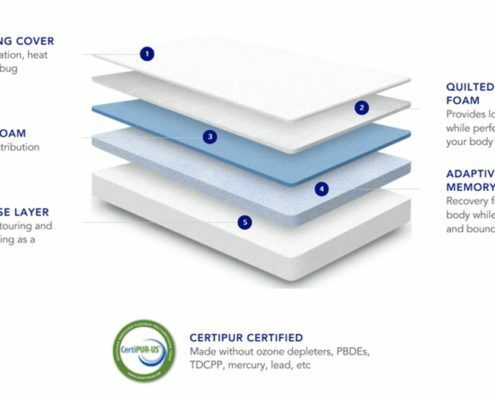 Since participation in Certipur certification is voluntary it is a sure fire way to tell that a mattress is fully safe, non-toxic and that any smell is simply the smell of wherever the mattress was manufactured. It is similar to a new car or new shoe smell and is nothing to worry about. We would normally recommend those that are concerned about off-gassing ensure to pick up a Certipur mattress – but since the Nectar matches this regard we have no worries! The mattress itself is virtually smell free. It smells a little new, almost like a new sofa brought home from the store. Once we placed our mattress protector and sheets over the Nectar we noticed absolutely no scent whatsoever. If you do notice a smell is ought to disperse within the first few days as it will not take long to pick up the scents of your home. Made without PBDE’s, TDCPP or TCEP(“Tris”)flame retardants. Made without mercury, lead and other heavy metals. The Nectar mattress is a full memory foam bed – so if you need the firmer support and bounce of a sprung mattress it may not be for you. That being said it does have enough support to make suitable competition…and with 365 nights of trial period why not give it a shot? 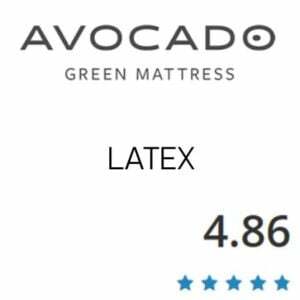 As well as being a reasonably soft to the touch mattress, Nectar were a little concerned that the mattress would sleep hot (as is standard for any full foam mattress). To combat this they added a top layer to their four foam layers, but this time made it an adaptive cooling cover that helps draw heat away from the body, making for a much more comfortable sleep than most full foam beds. A mixture to Tencel Fabric, gel memory foam and slow response foams combine to make this mattress just as soft as they say. Best of all is the suppleness you find in this bedding. It doesn’t feel like it will swallow you whole and when you lie on it you are enveloped – but not to the point of suffocation. It is a delicate balance which we think Nectar have gotten just right. We gave the Nectar a 9.5 out of 10 for comfort and feel. We had to take half a mark off to represent the fact that some people just love a sprung bed, so the Nectar won’t please everyone. However, for most of us it is a fantastic fit. Like with most memory foam mattresses, the Nectar mattress is an excellent choice if you want a comfortable mattress with little to no motion transfer (the phenomena where one occupant shifts position in bed and that motion is felt throughout the entire mattress, potentially disturbing your partner from their rest). In the case of the Nectar mattress, the multiple layers of memory foam function together efficiently to prevent pretty much all motion transfer, and the quilted cover assists in that regard as well, resulting in a dependable mattress that will let you and your partner rest undisturbed throughout the night. The Nectar’s base layer is made of firm foam that is some 6 inches thick. As well as being great for edge support, this foam is also OEKO-TEX Standard 100, Class 1 Certified. The foams that the whole structure uses as slow to react and conform to the shape of your body, and the quilted cover adds some support from pressure. All of this adds up to create a memory foam bed with acceptable edge support. Traditionally speaking, full foam bedding is notorious as having little to no edge support and you are able to slide right off the edge. The combination of quilting and supple strength presents this with the Nectar, and allows for a better quality product than most. There isn’t much bounce to this mattress but when sitting on the edge you shouldn’t expect it to sink more than two thirds of the way down. Overall the Nectar mattress is one of the best we have tested concerning foam quality & performance, especially for the price. What is above average on the Nectar is the build, quilted gel, a Hi Core Memory foam as a transitional layer vs. just a poly foam layer. The above average foam core. It uses a 2.2 Density vs. the average 1.8. I really liked that this has an actual memory foam feel same as the quilt on top. It seems to hold you up just a tad more than it would just be using a thin cover on top, so you get that memory foam feel but not as much of a sinking, stuck feeling like you do on some memory foam mattresses. In addition, the 365 night trial and Forever Warranty are very impressive. As a store owner, I like to sell medium to medium-firm mattresses vs. super soft. The reason being they will not develop body impressions as quickly and therefore you will have fewer warranty issues down the road. I think Nectar modeled their feel based on a similar thought. You will like the Nectar if you want that 6-7 out of 10 with 10 being the firmest. Also, you need to love a true memory foam feel. It has very body conformance and pressure relief. I primarily sleep on my side. The Nectar felt great for my hips and shoulder. It’s got a firmness to it, but once you lay there for a few seconds, the foam reacts, and you sink in a bit, and it conforms very well. Generally, I like a softer mattress, but this worked well for me in all three positions and had excellent motion reduction too. You can tell it has above average foams and foam core just by laying down if you have tested many as we have. I recommend this for anyone looking for a good deal and anyone looking for the memory foam feel. Thanks to that Tencel Fabric – which is a highly breathable, environmentally friendly fabric that allows for free airflow around the body – allows for a lovely, cool top layer that keeps you fresh all night. Air simply doesn’t get trapped in this mattress like it does in others. As well as the gel-cooling layer on the top there are four more separate sections to the Nectar, allowing for maximum airflow through the mattress even while you are lying on it. Since traditional memory foam mattresses tend to sleep hot we fully respect the research and thought that has gone in to solving the temperature issue. They have even added a quilted feel to that top layer to make sure your body isn’t flat against the foam all night through, which can have you waking feeling sticky. As well as taking care of the temperature aspect this quilting also provides a distinct separation that prevents the feel of memory foam against the skin… an aspect which puts some potential customers off. Nectar will perform great on an adjustable base. Being an all foam mattress, it will bend easily and lay back flat with no worry of harming the mattress at all. Using the Nectar on an adjustable base can add a lot of benefits. Adjustable bases can help with some things such as acid reflux, snoring and just finding a more comfortable sleeping position to ease joint pain and pressure in certain areas. Shipping – free shipping, it arrives compressed in a box. 3-6 days for shipping typically. The Nectar mattress comes with a 365 night risk free, no-obligation trial. This means you can order it, have it delivered to your home and try it out across the span of four whole seasons before you commit to buy. Shipping of your mattress is usually fast and free. Just to give some perspective on how good a trial period this is: the industry standard is one hundred nights. To increase this three fold speaks to the confidence the firm has in their product… and is very impressive indeed. As for warranty – again, Nectar outdo themselves. Each mattress comes with a forever warranty, meaning that it is covered against damages due to manufacturer’s fault for the entire lifetime of the product. When you buy a Nectar mattress you might never need to buy another mattress ever again…and that trial period allows you to make sure you like it before you commit. Industry standard warranty time is ten years, so once again this is clearly an impressive contribution. Nectar is one of the fastest growing online mattress companies. Now that Nectar has worked out the kinks they have hired a whole team to run the show. Customer service has been ramped up too. The most prominent thing holding them back is keeping stock in, which is a good problem for them. “We believe something as important as bedtime, where we spend 1/3 of our lifetime, should not be left to faceless publicly traded companies which work hard to save every possible penny on construction and materials. We also don’t believe inflated retail store markups, which pay large salesperson commissions, help you buy a better mattress. 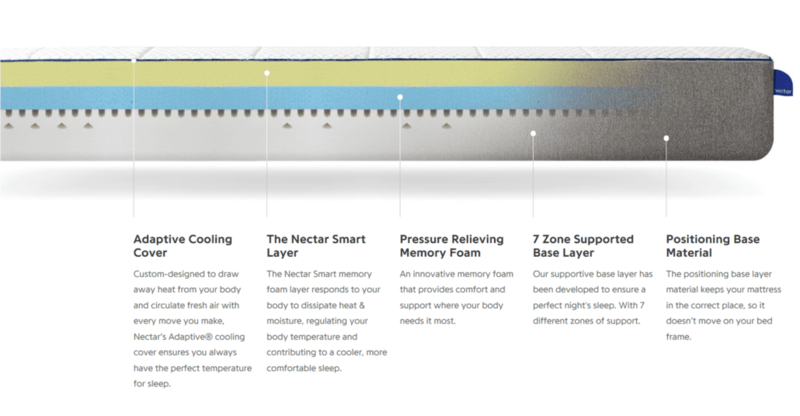 At Nectar, we focus on one thing only – the most comfortable bed possible. Everything we develop, design, and test have only one mission, your rest. We don’t care about quarterly earnings or earnings per share. We don’t need to because we are not “Big Mattress”… Nectar is 100% Employee Owned. We care about our customers first and making sure our customers agree that Nectar is the world’s most comfortable bed. By cutting out intermediaries and markups our mattress is priced at 1/3 the cost of the big firms, but Nectar has won more awards in the last two years than most of the big guys put together. 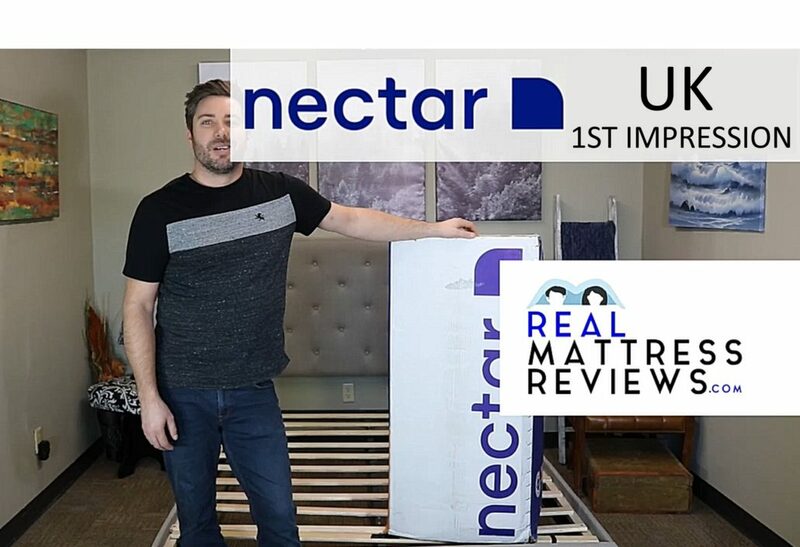 Overall for this Nectar Mattress Review, the mattress seems to be one of the best mattresses on the market at the moment. It is made of top-of-the-line materials and put together with high-quality craftsmanship and is still fairly priced when compared to competing brands. It ranks highly in all areas of assessment, from motion transference to edge support, and comes with a lifetime warranty that covers any and all defects. The multiple layers of memory foam provide a combination of support and comfort, and can also help with pressure relief in troublesome areas like your shoulders, back, and hips. There have been instances in the past where the high demand for Nectar mattresses outstripped the number of mattresses they had available, but they seem to have resolved this production issue since then. They also have an excellent customer service department that will answer any and all questions you might have, whether it’s about setting up your 365-day free trial or simply a question about the qualities of the mattress itself. All in all, if you want a fabulous mattress for a fair price, consider checking out the NectarSleep mattress. Overall the Nectar mattress is one of the best we have tested, especially for the price. What is above average on the Nectar is the build, quilted gel, a Hi Core Memory foam as a transitional layer vs. just a poly foam layer. The above average foam core. It uses a 2.2PCF vs. the average 1.8. As a store owner, I like to sell medium to medium-firm mattresses vs. super soft. The reason being they will not develop body impressions as easily, and therefore you will have fewer warranty issues down the road. I think Nectar modeled their feel based on a similar thought. You will like the Nectar mattress if you want that 6-6.5 out of 10 with 10 being the firmest. Also, you need to love an actual memory foam feel. It has very good body conformance and pressure relief. We rate Nectar so high simply because of the materials that are inside of it are above average for space and the price is lower than many brands that are lesser quality. Nectar truly is a very good value. Nectar experienced some backorder problems because of the demand but it seems like its mostly caught up & they recently internalized their customer service.